Springtime is here! And what a better way to Celebrate than with a delicious smoothie?! Making a smoothie doesn't have to be complicated and it doesn't have to break the bank. In fact, I love throwing in whatever kind of fruit I have, some yogurt and ice and presto! a smoothie the whole family will love. That's my "M.O", but it coesn't have to be yours. 2. Add ice first, then liquid, then fuit. cuts down on large pieces of ice hiding near the top. 3. A liquid base is a must. 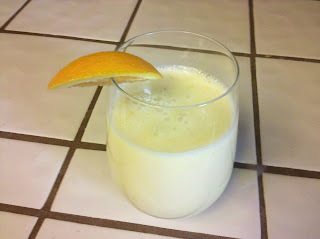 1 cup of fruit juice: OJ,apple, pineapple, etc. 4. Fruit is the variable. 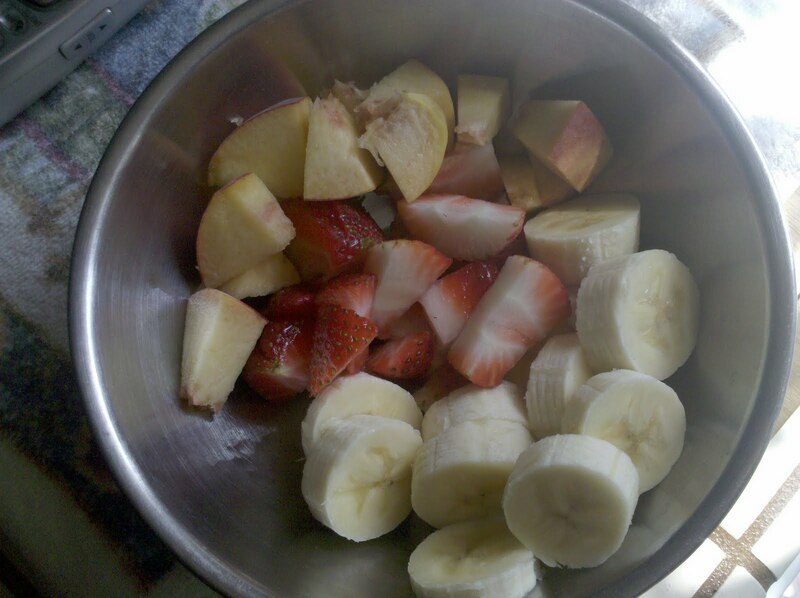 You can add pretty much any fruit together and it will taste yummy. I even have a "go-to" smoothie called "everything but the kitchen sink". If I don't have enough of one item, I just start adding in whatever fruit I have on hand, toss in a spoonful of sugar and it's good to go. 4. When is my smoothie done blending? This one I learned from my mom. It's done when the smoothie starts folding in on itself. It kind of makes a little "whirlpool" in the center of the blender jug. 5. What if I want it sweeter, but don't want to add sugar? Honey is an awesome substitute, but I wouldn't ever use honey if you were making it for very young children (under 2) as they are unable to metabolize it. We drink a lot of smoothies in our house. My favorite tip is to use frozen fruit instead of ice. Instead of using 1 cup of fruit and 1 cup of ice (or whatever your ratio) just use 2 cups of frozen fruit. The flavor is better, in my opinion. Oh, my other tip is to freeze your bananas when they are too ripe to eat. They are great in smoothies. We love strawberry banana or banana with peanut butter! One more tip - use Greek yogurt; the consistency is better. Am I being annoying? I'm sorry! Those are some great tips and can't wait to use them the next time the boys want a smoothie! Instead of or in addition to ice we use frozen fruit as well. And I do that banana thing too! But it's not often in this house that 'nanas get a chance to ripen much. We call the whirlpool effect the "smoove" So your smoothie is done once it's smooves. Interestingly, it me and not my kids that came up with that. I used to end up with the lumpiest smoothies until I figured out a natural ratio - sometimes a recipe called for too little liquid, or it would get stuck. I have decided that you are a genius with muffin tins! And probly some other things too! LOVE it! Hey...Check out my site and maybe win a great kids book and a handcrafted surprise! We *heart* smoothies. I've been using frozen fruit because I didn't like the big ice chunks...good to know about adding the ice first! I have also been using vanilla yogurt and don't need the sugar/honey to sweeten it up. There isn't a day goes by in this adobe that my daughter doesn't make a smoothie (or four). Someday she might need an intervention for smoothie addiction. I am loving your blog! Love all your projects! I am going to book mark it for sure!